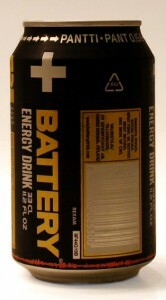 Battery Energy Drink is an energy drink from Finland. In the US the drink is marketed by Atlantic Beverages. In the UK the drink is marketed by Carlsberg. It was my sophomore year of college that I first realized the true utility of energy drinks. Like a peasant without a religion, I embraced the promises of a turbocharged lifestyle, void of the horrible taste of coffee. Just as most energy drink beginners, I started with Red Bull and Monster. It didn’t take me long to realize Red Bull was not worth the price, and Monster became my collegiate teat. Yes, I said teat. I lived off Monster that year. It rang in the dreaded morning classes and christened the late night study sessions. So what did I do? I bought 50 cans in bulk for the whole year. I finished all but 10 of them, not because the year ended, but because the taste and smell of the drink soon came to reliably induce a nice little feeling called nausea. For the following year, drinking Monster would leave me looking for a toilet to vomit in. This, thankfully, has subsided. But to this day, though, 3 years later, the smell still makes me shutter. I got the opportunity to drink a Battery Energy Drink the other day and upon opening the boring black bottle (WHY ditch the awesome look of the can?! ), I was greeted with the undeniable smell of Monster. I promise I’ve done my best to ignore the initial gag response, and I strived to taste the drink for all it’s worth without bias. Monster Jager Bomb. You’ve heard of Jager Bombs I’m sure. Part energy drink, part Jagermeister alcohol. Together, they obliterate your inhibitions. Jagermeister has a distinctive black licorice taste and this is undeniably present in Battery. So, simply, this drink tastes like regular Monster with a moderate hint of black licorice. I was fine with the Monster taste. Personally, I can’t stand the taste of black licorice so this drink was not a pleasant experience for me. Maybe it will be for you. Gee, I’d love to write a little about the drink here, but the ENTIRE ingredients list does not contain one English word! Wonderful. According to the website, the main energy ingredients in this drink are caffeine, taurine, maltodextrine, guarana, and b-vitamins. The only portion listed on the site is for caffeine. There are 320mg of caffeine per 100 centiliters (AKA 1 liter). Wowzerz, right? Riiggghhht too bad this drink only contains 45 CL, equating to a not-so-special 144mg of caffeine. That 320 number seems like more of an advertising gimmick to me, just state the applied facts please and spare us the math! Thankfully, there’s apparently more to this drink than caffeine. What this drink lacks in taste and English-speaking-consumer friendliness it makes up for in energy. I got a very quick boost in energy that lasted for 3-4 hours, I admit I was fairly impressed. If you come across this drink, I’d say it’s worth giving a try. Whether you’ll like the taste is a toss-up, so I’m not going to suggest you go out of your way to track this drink down. Unless you’re a black licorice gobbling, Jagermeister guzzling fiend, that is. It's not often I get the chance to review a drink from a place as cool as Scandinavia. With tales of viking conquest and the some of the highest human development ratings in the world, I got to wonder what they use to keep themselves productive and alert... and I may have the answer in my hand. I'm holding a can of Battery Energy Drink, originally from the land of Finland. Presenting itself in a stubby, polarized can, I'm wondering if Battery will leave me feeling positive, or perhaps negative? Battery has a very tart, electrifying flavor with a subtly sweet after taste similar to candy like Rockets. It has a liberal amount of carbonation, but isn't too heavy, so you could down this fairly quick and it would taste alright. Containing regular sugar, there's no artificial sweeteners that add any weird tastes. It isn't anything amazing, though, as many other drinks on the market feature a similar taste. It would benefit from being a bit sweeter. This can encapsulates 105.6mg of caffeine (32mg/L), and concentrations of taurine, B6, B12 that are a fairly common elixir in the modern energy drink. With a little more caffeine kick than most drinks in its size (11oz/330ml), I'm speculating that this could be an excellent balance of a satisfactory drink and a pick-me-up. Battery was just right to get me out of my mid-day slump and back into gear as I navigated through my books. Stimulating me enough to rise above the waning effects of my previous drink that day, Battery came through with an electrifying jolt of positive energy. I seemed to be in a better mood because of Battery's "charge"! This amplifying drink from Finland was certainly a positive mix of soda-like consistency, tart taste, and the charge I needed to break into the books. Battery definitely has potential and with a bit of added sweetness, it could rise above in the saturated energy drink market. Sugar content: 35 grams (per 11.2 ounces). How Does Battery Energy Drink Compare? Battery Energy Drink contains 9.46 mgs of caffeine per fluid ounce (32.00mg/100 ml).